Once upon a time, cowhide rugs were reserved for hunting cabins and establishments with mechanical bulls. 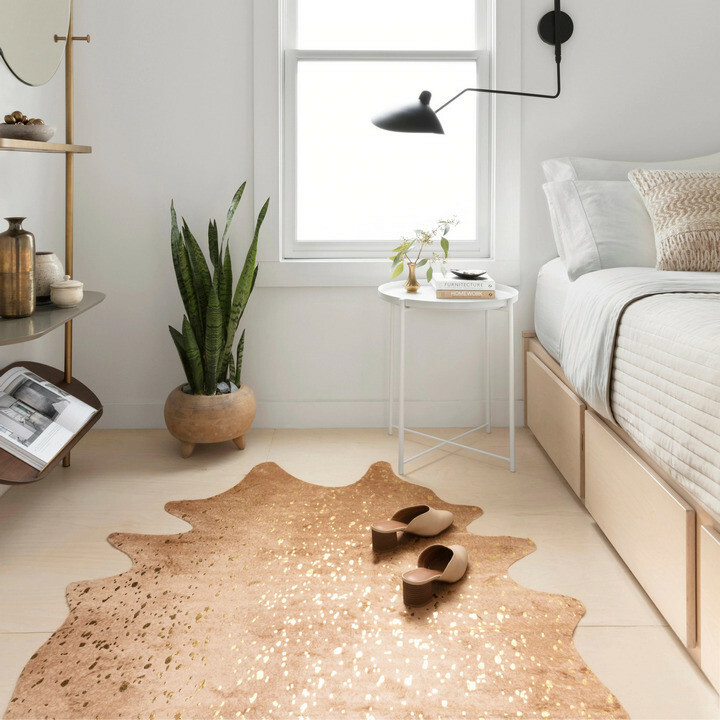 Now, if you see a room that successfully features a cowhide rug, it's hard to get that classy, stylish accent out of your mind. These rugs are quickly gaining popularity in high-end interior design because of how versatile, durable, and cozy they are — but before you incorporate one into your space, it pays to do a little research. 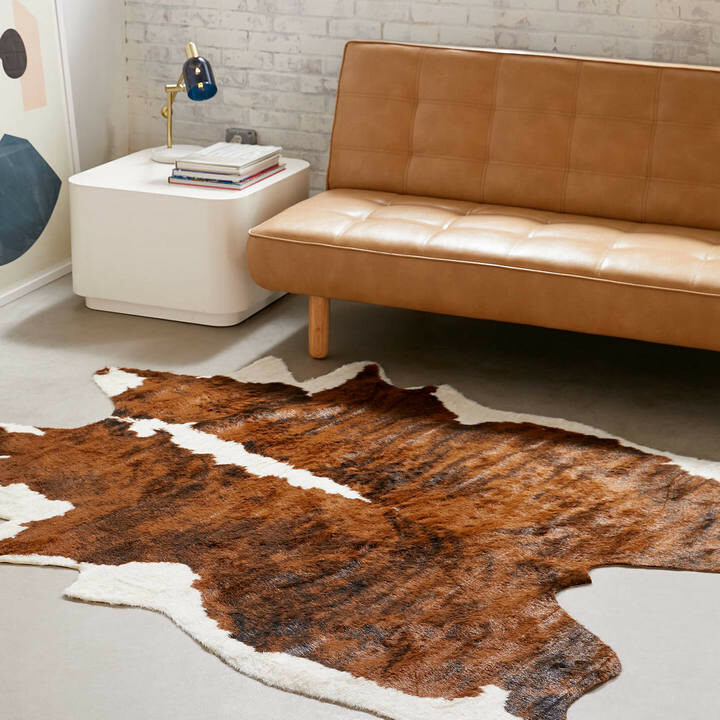 First thing's first: How do you select a high-quality cowhide rug? If you're purchasing off the internet, take a close look at the pictures — the hide should be shiny, glossy, and soft-looking. (It's important to note that, for real hides, you obviously won't be getting that exact one; it'll be a "similar size and color," so if possible, take a look at the reviews and make sure that past buyers were happy with the rug that was actually delivered to them.) Next, check the country of origin. According to manufacturing experts, the highest-quality cowhides come from "Brazil, Argentina, Columbia, and France." A quality hide will be hypoallergenic, relatively stain-resistant, and last you years — even when placed in a high-traffic area of your home. If you're concerned about the animals' well-being, you can find a company that's more humane in their practices and will only use hides from cattle raised for food. That said, you also have another option: a synthetic (or faux-hide) rug. Because they're often made from polyester or other man-made materials, they're usually not quite as durable or soft — but they'll be much more affordable, and you can rest easy knowing your rug is cruelty-free. Don't know where to start? 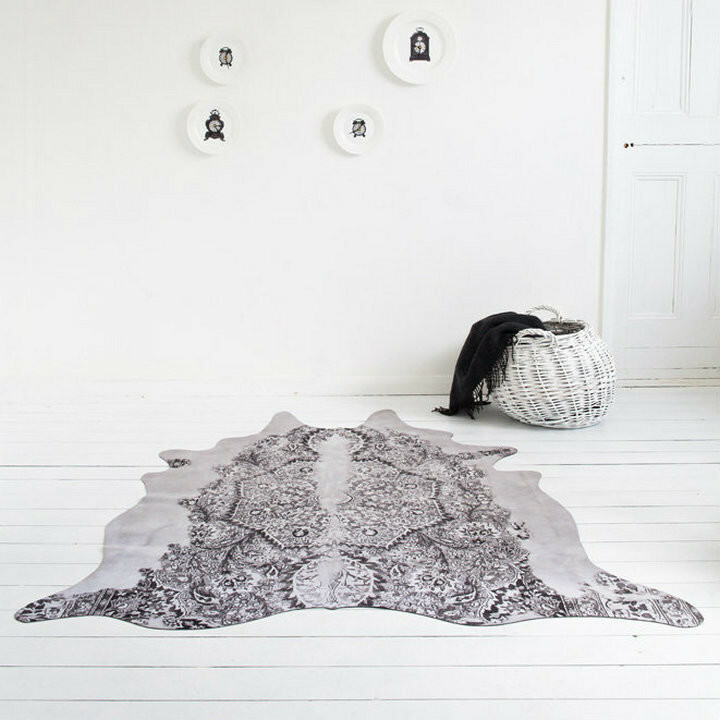 Take a look at these 12 popular cowhide rugs for every area of your home. There's a pick for any price point and color scheme — plus there are real options as well as fake ones, so all different kinds of shoppers can feel good about their new, chic accent. 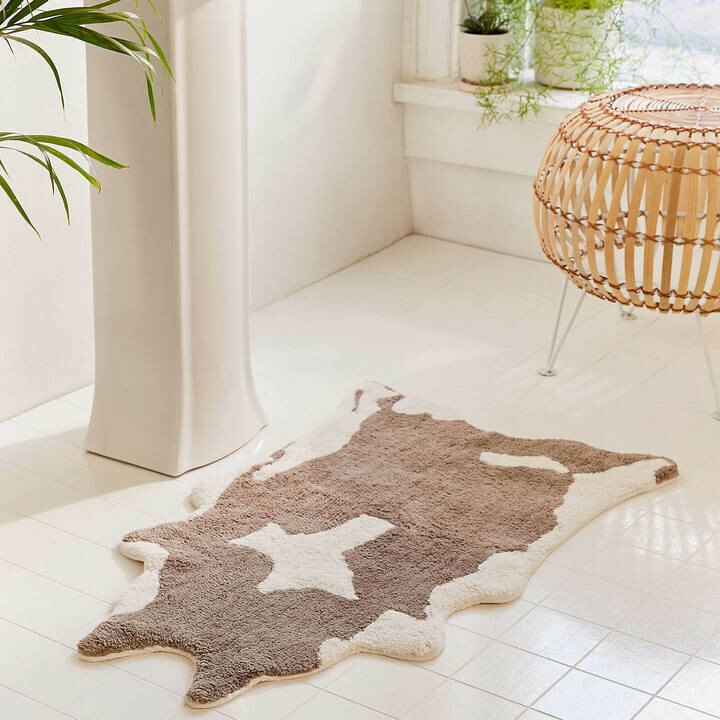 A genuine, natural hide available in two sizes and over a dozen colors and patterns — what more could you want from a cowhide rug? The Lettie from Millwood Pines is handmade and hand-woven with a felt backing material for extra thickness and longevity. It has the soft sheen that you should be looking for in a genuine hide (check out this video to see for yourself), and so far, reviewers have given it an overall rating of 4.4 stars. The best thing about this pick is its versatility. Since you've got so many options, you can choose a pattern and a shade that'll suit any room in the house. Reviewers also say it's "well-made" and "stands up" to toddlers, pets, and high-traffic spaces, so you can put it at the foot of your bed or in your foyer. After versatility, the price is the second-most important contributor to this rug's title of best overall pick. Wayfair is known for its regular sales, but if you catch this rug in between deals, you can still get the largest size for under $800. For a statement piece that's equal parts rustic, boho, wild, and affordable, look no further than this faux-hide rug from Urban Outfitters. It's made entirely from polyester, which means that it's still durable, soft, and washable, but the synthetic material also means that you can get this pick for well under $300. It's available in three different patterns (brown cowhide, gray cowhide, and black and white zebra), and all of them utilize rich colors, careful detailing, and a faux-suede backing, so they look like the real deal. 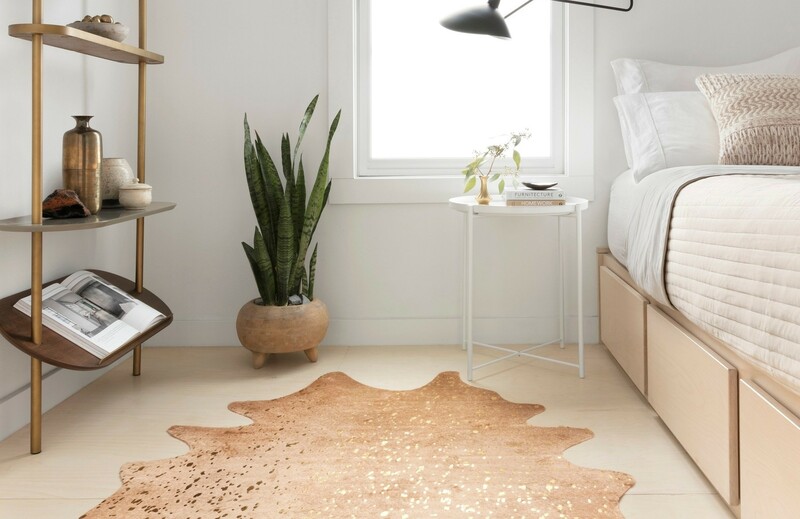 You may be one of those people who's still not sold on traditional cowhide, and that's okay — the asymmetrical shapes and animal-print patterns aren't for everyone. 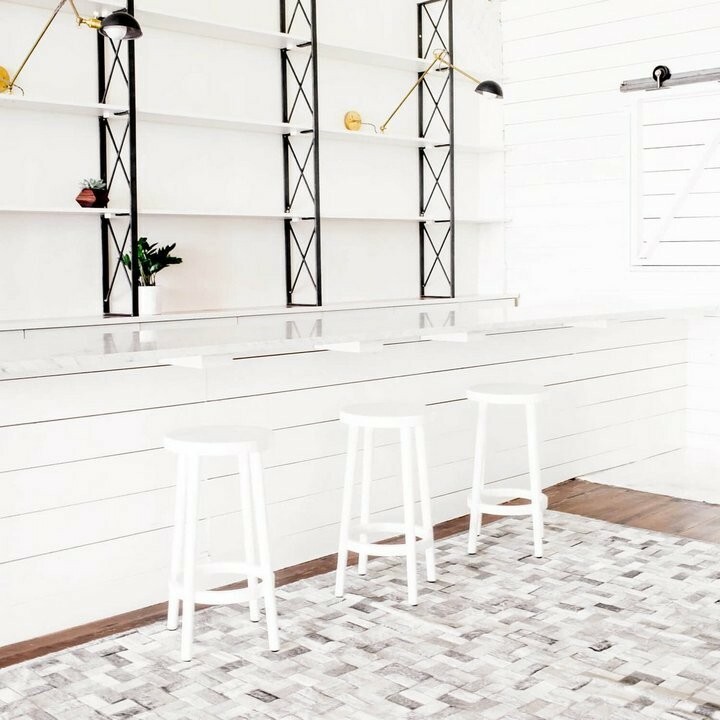 If you prefer clean, 90-degree angles and subtle details, this patch cowhide rug gives you the best of both worlds. It's made by hand-sewing real hide squares into a larger rug, quilt-style, which gives it a sophisticated look — but you're not missing out on the durability or softness that hide rugs offer. Each rug has a cotton and canvas backing that improves the longevity, and its natural markings range from a soft beige to a light tan to support a neutral palette while still offering texture and visual interest. You can also get this rug in gray, and both are available in three sizes. There are definite dos and don'ts when working with any color, but since gray is especially popular right now, it pays to familiarize yourself with these guidelines in particular. Gray might seem like a no-brainer, but it has cool and warm tones like any other color. Charcoal gray is a great alternative to navy blue and black because it gives the room an elegant, sophisticated touch without going too dark. It's also relatively neutral, so it'll compliment both cool and warm color schemes. 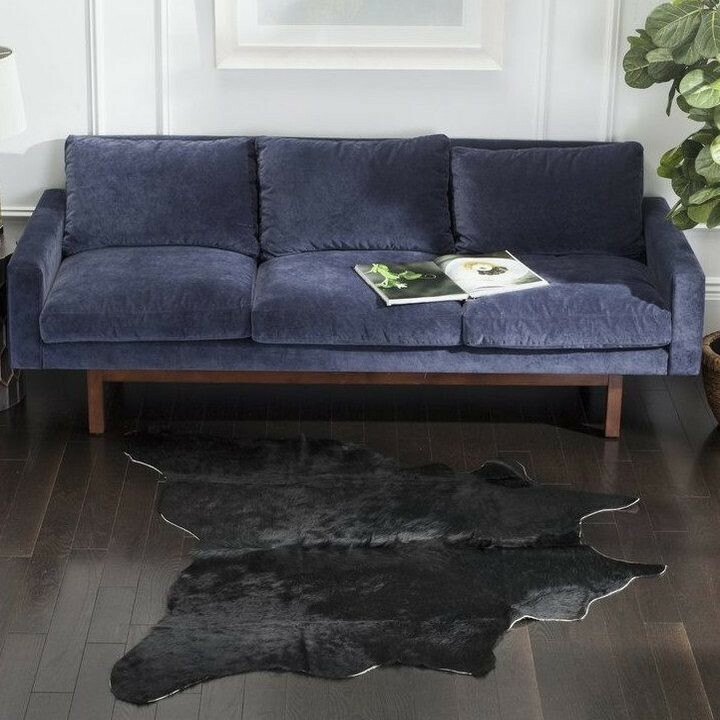 The Mercury Row faux cowhide rug is a great example, and a lovely addition to your dark palette. It's handmade in Brazil using 100 percent polyester, but with a quarter-inch pile and convincing markings, it still has a warm, natural effect. 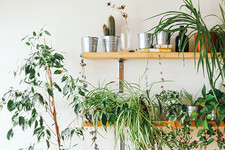 Place it in your man cave or modern cabin for an accent that's grounding, but not overwhelming. This is not your average cowhide. The Pasos from The Citizenry is in fact made from real, Argentinian hides, but it's hand-stitched into a cross-weave hatch for a contemporary take on the style. It's also backed with nylon, so it can take "all that life will throw at it," including traffic, dirt, mild stains, and time. Since each rug is handcrafted by master artisans in a fair-trade environment, every single one is subtly unique. If you're looking for a modern pick that ties a large space together, this one's the choice for you. 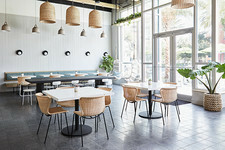 Its eight-by-ten design includes a crisscross of white, gray, beige, charcoal, and black for tones that are compatible, but striking. This rug is easily the most expensive option on this list, but because it's stylish, durable, and unique, it's definitely worth the splurge. When it comes to caring for your rug, water and cowhide to not mix. 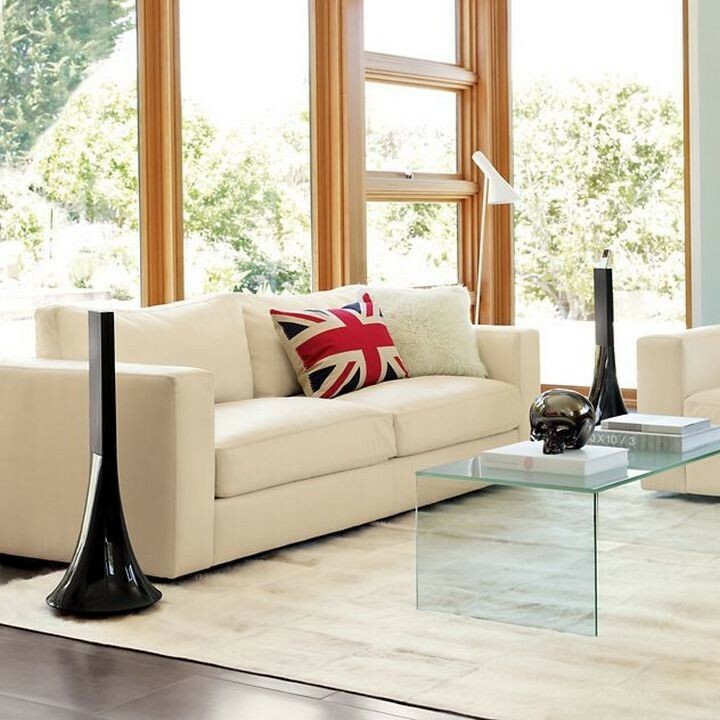 In fact, moisture can severely damage a cowhide, so it's best to keep this accent in a dry room, far away from potential stains. Luckily, Urban Outfitters came up with a smart alternative for those who'd like a rustic, cozy touch in their bathrooms. This faux-hide bath mat is made from fluffy, terry-knit cotton. Thanks to the material choice, it's natural and capable of absorbing water drips and handling makeup spills. In fact, if it starts to get a little dingy, you can throw it right in the washing machine. Reviewers have great things to say, like: "I have a super small one bedroom apartment, which means my bathroom is tiny. This bathmat fit perfectly and completed my aesthetic. Highly recommend!" They even posted a picture of their cat sitting on it, so it must be comfy. Experts advise people to avoid bold colors and busy patterns in the bedroom — but an intricate rug could help to get the juices flowing in an inspired home office or other creative space. 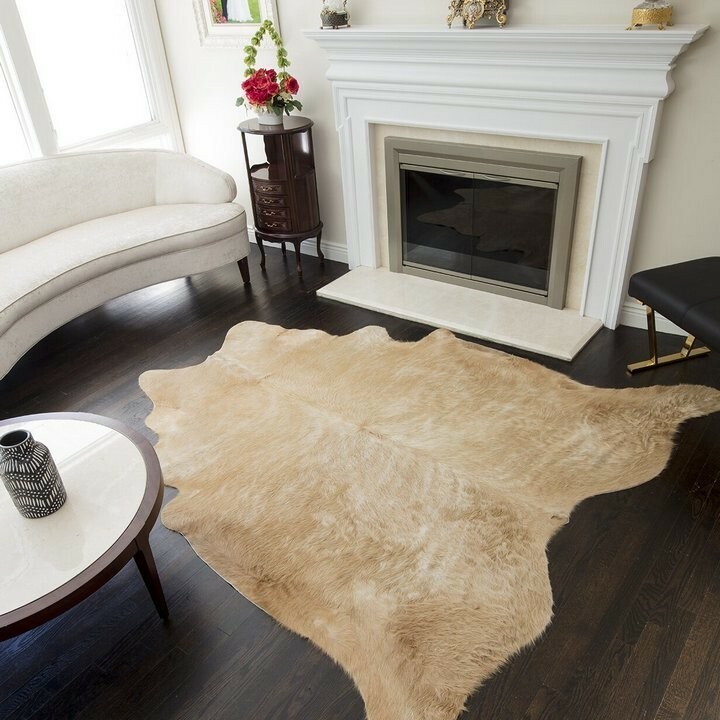 This Young & Battaglia cowhide has the irregular shape and silky-smooth feel of a real cowhide, but the eye-catching patterning of a traditional Persian rug. Both features come together to form a statement piece that's equal parts art and practicality. This pick is hypoallergenic, washable, and already non-slip thanks to the rubber backing — so there's no need to worry about a rug pad, though it may increase the comfortability-factor. Finally, it's available in three Persian patterns: blue and brown, black and gray, and ivory and gray. As far as faux-hides go, few are as classy and convincing as this one. 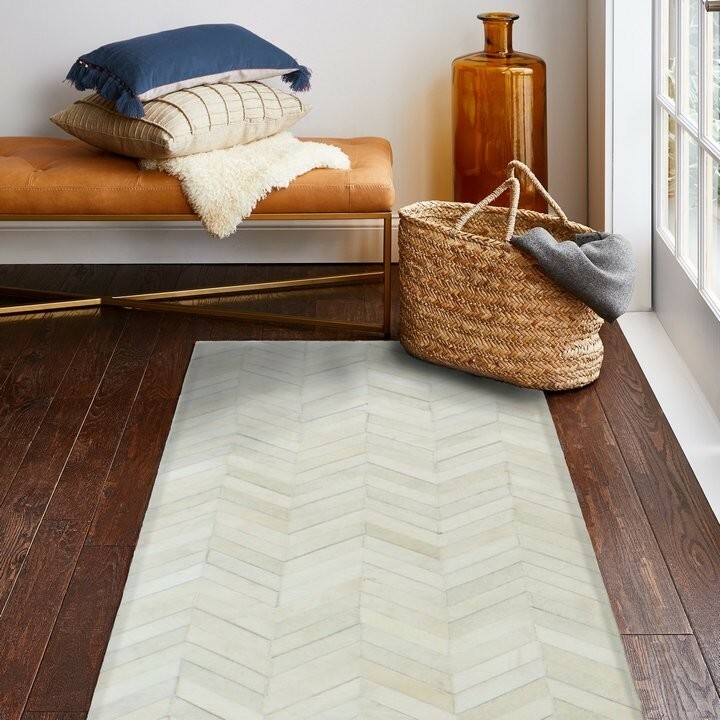 The ivory cowhide from World Market captures the texture and subtle patterning of a real hide, but it's instead made from synthetic fibers with a brindle print. It also has a reinforced polyester backing that stands up well to spot-cleaning and gentle vacuuming. Even though it's thin, reviewers say it looks "much more expensive than it costs" — and it feels "extremely comfortable" under your feet, too. 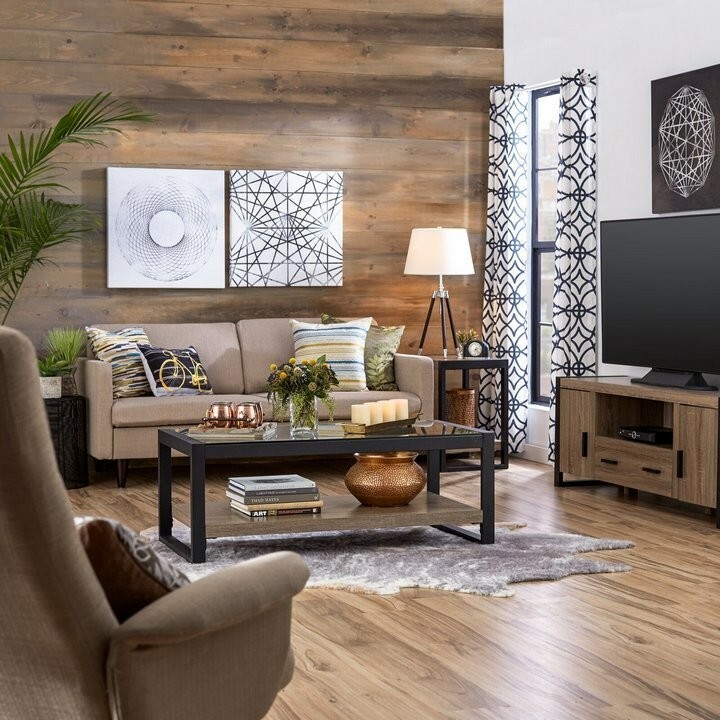 The short fibers have a suede-like texture that'll warm up your living room, dining area, or bedroom, and since it's light beige with tan undertones, it'll match virtually any color scheme and effortlessly brighten up a dark room. Argentina is one of the four main countries that's known for its high-quality cowhides, and the Sabrina rug comes straight from the grassy Pampas region. It's a good pick for someone who's looking for understated elegance in their space; instead of long fur and busy patterns, the Sabrina rug features a relatively-short pile and an all-black color. When used in a monochromatic room, this rug will both catch the eye and tie the entire look together. Since it's a bit smaller than other options (specifically four feet by six feet), this rug is best-suited for small living spaces and tight entryways. Thanks to the durability of real hide, this one can handle the foot traffic, so don't be afraid to place it in your most-used room — but be sure to keep it out of the way of direct sunlight, which can cause the black to fade and the hide to dry out over time. 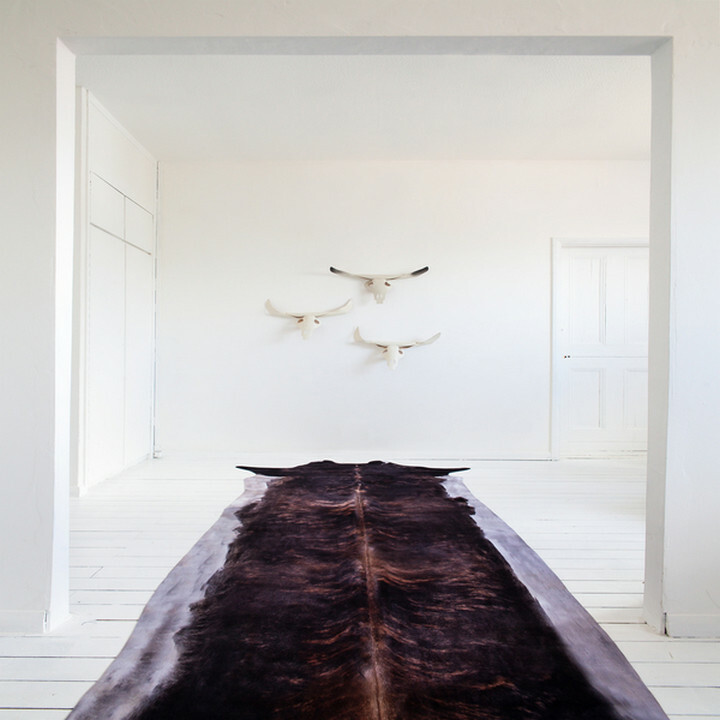 Cowhide rugs don't have to look overly-rustic. In fact, some designs can look quite modern, like this pick from Trent Austin Design — and since it's made using genuine hide, you're getting the softness, longevity, and durability that's typically associated with these types of rugs. This rug comes in six different sizes, from a runner to a ten-by-14 area rug. "[This] rug is absolutely beautiful. It gives our room a very modern look, yet it’s soft and functional," says one reviewer. "The gold spots add just enough of a glamorous touch to make it fit in with the rest of my decor," one reviewer says. This pick measures six-by-eight feet (roughly), and is made so well, it can even handle high-traffic areas. Oftentimes, hallways and awkward transition areas can look cold. There's really no room for furniture, so people tend to leave them empty — but a well-placed runner serves as an easy way to warm up the space and make the entryway look more inviting. The Mineheart stretched cowhide is the perfect pick for these situations. It's elegant, looks genuine, and most importantly, helps you make the space more accessible instead of less. This piece looks like it came from an especially-long cow, but in actuality, the hyper-realistic pattern is digitally-printed on a rubber-backed synthetic material — and the detail is impeccable down to every last hair, so your guests will never know. It's also extremely easy to care for, granted it's washable, durable, and always lays flat instead of curling up at the edges. You can get this pick in natural brown or bleached beige, and it comes in three sizes: small, medium, and large. 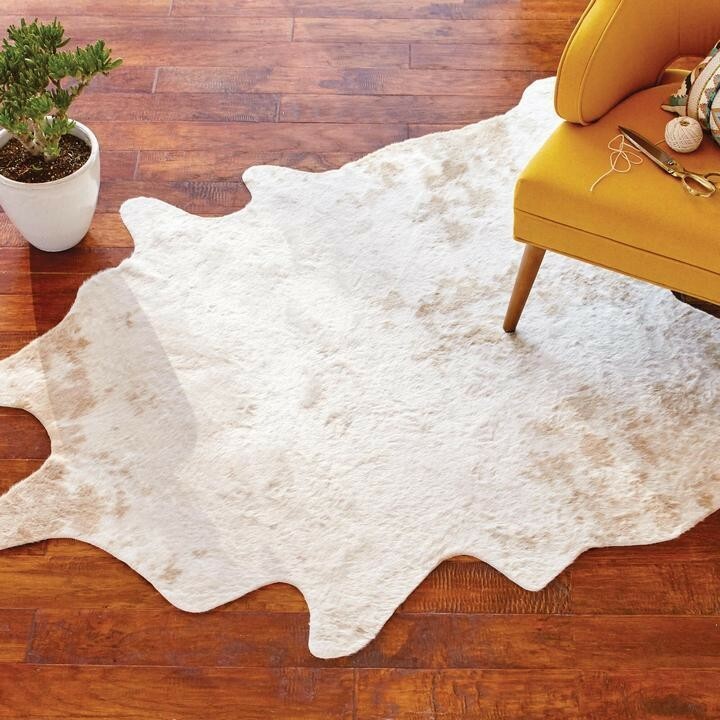 We hope you found the perfect cowhide rug to compliment your space! So you know, Lonny may collect a share of sales from the links on this page.